Those looking to reduce their sugar intake can find plenty of sugar-free sweeteners here at Round Eye Supply, including top-name brand products from Equal, Sweet-'N Low, N'Joy and Truvia. Artificial sweeteners are available in saccharin, aspartame and green stevia. Select from non-sugar sweeteners that include sugar alternatives for coffee, sugar substitute for baking or sugar substitutes for sweetening cold drinks. Sugar and Sugar Leg Misty River Sugar Substitute Pink Packets 1 Grm. Stratas Foods Equal Sugar Substitute - 6 Lb. N joy Sugar Substitute Green Stevia - 1 Grm. Sugar Substitute Sweet N Low European Stick - 1 Grm. Bar Tea Sugar Substitute - 1.48 Lb. 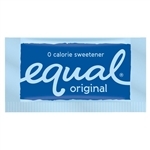 You have many choices of sugar alternatives, including both low-calorie sweeteners and zero calorie sweetener. These sugar-free substitute products are offered in large wholesale quantities at great discount prices. Many of our one-gram packets of sugar substitutes come packaged 1000 or 2000 packets per case but are also available in smaller cases of 400 or 500. You'll also find 6.6-ounce bags of America's favorite sugar substitute, Sweet-'N Low, six bags per case, designed for use in vending machines. Equal also comes in bulk bags, 6 pounds per unit, six bags per case.